Reclusive writer and composer Mac Fallows first began pitching the idea of a musical book for teens and adults to music and book publishers in the late eighties. But without the technology to support his vision, he didn't get far. So instead, he set out to travel the world in search of new challenges . . . and stories. He went on to write and produce over 100 songs in a dozen languages in places including Dakar, Mumbai, Prague, and Santiago for singers including Youssou N'dour, Shankar Mahadevan, Pape and Cheikh, and Kavita Krishnamoorthy. Wondertown is the first true musical story he's published. It includes a full-length fantasy novel, 12 related songs and 17 illustrations. Visit his website at www.wonderlandproject.com. A&RBC: Thank you so much for this interview, Mac! Can you tell us where you are from? MAC: I’m Canadian. I was born about an hour outside of Toronto. A&RBC: How did you come up with your title? MAC: It came to me the way a good melody does- all at once and without warning. I was picturing the world Rabbit lived in and there it was. A&RBC: They say you can judge a book by its cover. Can you tell us a little about your cover and who designed it? MAC: Emrah Elmasli, a brilliant Turkish illustrator, drew the cover and 16 other illustrations in the book. It represents one of the scenes in the book- and one of the songs. A&RBC: Can you tell us something about your book that would make me run out and buy it? MAC: It’s the first full-length fantasy with 12 original songs embedded in the story, sung by the characters themselves. The songs really extend the story beyond the words. You feel it more deeply and it stays with you longer. A&RBC: Are there any messages in this book that you want the reader to know about? MAC: Well, it’s allegorical, so you can dig a bit and find meaning beneath the storyline. But I’d rather the reader decided how deep to go. A&RBC: What was your most favorite chapter to write and why? MAC: The first one, because I was finally bringing the story to life. I also enjoyed writing the scene where Rabbit came to the lowlands for the first time; it reminded me of those moments in my teens when I was crossing some kind of boundary for the first time. A&RBC: Why did you feel you had to write this book? MAC: When a story takes form in your thoughts, it’s very difficult to keep it there. And I’ve been determined to publish a musical book for a few decades now. A&RBC: Now, some fun questions – What deep dark secret would you like to share with us? MAC: Not that dark, but humbling, for sure. When Donavan Bailey won the 100m in the Olympics, I started training the day after thinking I could make it to the next Olympics in the 400m. I was 30 years old at the time and never came close, of course, but I was serious, nonetheless. A&RBC: If you could travel anywhere in the world, where would it be and why? MAC: China, probably, as I’d meant to go when I was traveling the world looking for stories and melodies. For some reason, it just never happened. A&RBC: Are you a morning person or a night person? MAC: Morning person. When the sun comes up, it feels like I have another shot at my challenges from the day before. A&RBC: Are there any members in your family who also like to write? MAC: I think everyone likes to write to some degree, but none of my family seem to want to write fiction of any length. My sister is an accomplished academic and an excellent writer in her field. A&RBC: As a child, were you a dreamer? A&RBC: Last but not least, the magic genie has granted you one wish. What would that be? A&RBC: Thank you so much for this interview! Do you have any final words? MAC: There are hundreds of successful, brilliant writers and songwriters no longer in the top ten of their respective fields. My hope is that they’ll give musical stories a try- either together or on their own- and help grow the genre. I’d love to read a musical story written by somebody else. 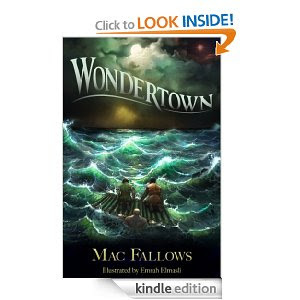 Wondertown is a full-length fantasy novel from Mac Fallows that includes twelve original songs-each one an extension of the story sung by the characters themselves- and seventeen illustrations from acclaimed illustrator, Emrah Elmasli. The story centres around Neil Abbott, an undersized, introverted eleven-year old boy with the ability to tell about people by touching their possessions. He doesn't fit in either at home or at school and rarely speaks to anyone, with the exception of his grandmother, who has a secret talent of her own. One day, after a particularly difficult week, Neil asks his grandmother if she thinks he's normal, and she responds by telling him the remarkable story of an unlikely hero, who long ago crossed the five parts of the world to free his only friend from a demon lord. Filled with hidden meaning, vivid images, and songs that bring the characters to life, Wondertown is an unforgettable journey to a place inside each of us few of us dare to go.